A bid a bidder makes on an item without being physically present. This allows you to place a bid that is higher than the minimum next bid. Free notification service that notifies a person via email when particular things happen. The act/process of estimating value. No return privileges will be granted. A way of selling property in a public forum via open/competitive bidding. Help buyers and different types include concurrent, block, and sequential. Concurrent Close: all lots close at one time on a particular date. Block Close: Certain blocks of lots close at the same time on a particular date beginning with the first block. The next blocks close at certain intervals. Sequential Close: Lots close sequentially starting with Lot 1 and each lot afterwards close at the time that&apos;s stated on the sales page. The person who directs or conducts a sale by auction. The podium/raised platform where auctioneers stand while conducting the auction. This allows a person to bid online but can&apos;t monitor an auction. The indication/ offer of a prospective buyer&apos;s price the person will pay to buy property at auction. The auctioneer usually establishes bids in standardized increments. A list of all bids made on a certain auction during/after the auction. The standardized amount an item rises in price following each new bid. The increment increases based on an item&apos;s present high bid value. The number a person registered at an auction is issued. These lots contain 2+ items. An extra service charge, the buyer is responsible for and might be added to the price of a sold item. The seller designates the price and if it&apos;s is paid sells the items instantly and closes the auction. An optional feature is the Buy Now Price when listing an asset. A publication that advertises/describes the properties for sale at public auction. It often includes property descriptions, photographs, and the terms & conditions of a sale. The person the principal auctioneer/auction firm hires to record what is sold, to whom, and for what price. The auctioneer might accept competing bids during a sale for an item from different sources including book bids, telephone bids, in-house audience bids, and absentee bids. The fee the auctioneer charges the seller for providing services. This is typically a percentage of the property&apos;s gross selling price established by contract (listing agreement) before the auction. This is a written description of the condition of an item and is typically included in the lot description. This is an assessment of any/all winning bids before the sale of assets. It includes a list of the seller&apos;s winning bids they can review. The buyer receives a final invoice after the seller accepts a bid. The auctioneer/auction house operator who the consignor entrusts goods to for sale at auction. The person/authorized agent/entity that consigns goods to auctioneer. The consignor is typically the seller. This is the present high bid. A bidder must advance the bidding via the following bid increment to become the current high bidder. This happens when a lot closes with 0 bids or the highest bid that is under reserve and extends the closing time. Money that a third party holds in trust by until the seller delivers an item to the buyer. The sale of property a person leaves after their death. Estate auctions can involve the sale of personal/real property. This extends auctions when a bidder places a bid within the last X minutes of an auction. Other lots close at specified times if no bids were received within X minutes. This is used to sell assets for one price. The assets can only be bought for the listed price. The process for determining an item&apos;s physical condition. There are different grading systems for different items. 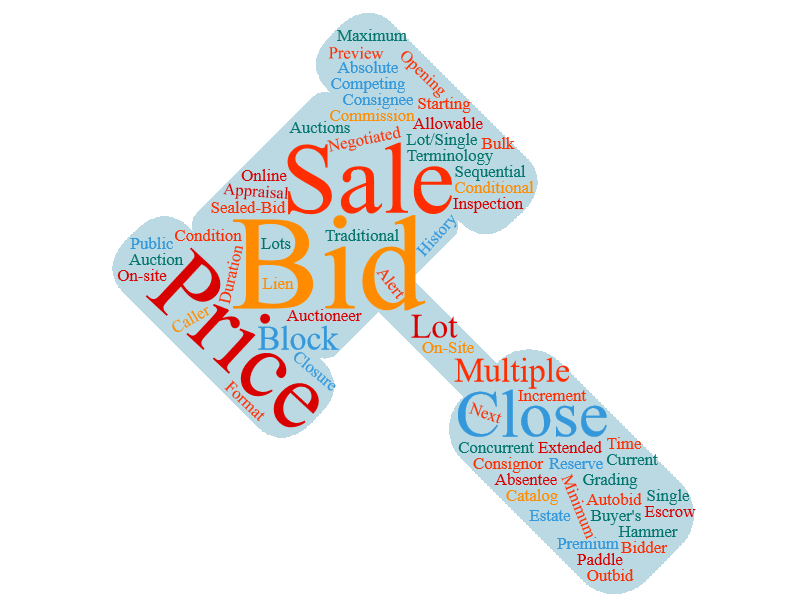 Price of the last bidder established/acknowledged by the auctioneer before dropping the hammer/ gavel to indicate a completed sale. An adverse claim/charge against an item when it&apos;s being used as collateral for a particular debt. An item/set of items for sale in auctions. A lot number usually denotes lots. This is the highest bid that can be made during an auction. This is the price the seller established, and all bids must be higher than this figure. This bid can be an Opening Bid or Reserve Price. This auction is for sellers who sell 2+ items to 2+ people for 2+ prices. This helps sellers to maximize revenues for more than one lot. This auction format is for sellers who want to sell 2+ items to 2+ people for one sale price. This helps sellers who want the easy tracking of 2+ prices to 2+ buyers. This is especially helpful when hundreds of the same lots are sold. Buyers are instructed to contact an auction representative to buy an asset. The offered lot is sold through negations between the auction house and the buyer. This is the lowest b price that must be bid to become the auction&apos;s current highest bidder. An auction that is only for online bidders and not conducted in front of a live audience. These auction types may have reserve items bid on by the auctioneers to protect the reserve. An auction that takes place on the premises of a property for sale. A bidder who participates physically at an auction venue. This is the required price the seller enters that must be met/exceeded prior to there being a high bidder. To submit a higher maximum bid than the maximum bid of another buyer. Specified date/time a property is available for prospective buyer viewing/audits before the sale. The minimum price a seller will accept for an item sold at auction. This figure is never disclosed formally. Each bidder submits one bid without knowing the other bids. After the bidding period&apos;s closing, the bids are opened at the same time, and the seller decides which bid they&apos;ll accept. The winning bid doesn&apos;t have to be the highest one. This takes place when the seller wishes to sell one unit/lot for one price/bidder. The lot can include multiple assets sold as a single unit or one item. The seller determines the duration. A given auction&apos;s likely starting bid, set at the time of listing by the seller. The auctioneer sets the time the lots end and the increments&apos; size. The person who bids highest wins the item. An auction conducted in front of a live audience at the physical location of items for sale.